India’s wicketkeeper Rishabh Pant didn’t have the best of starts as far as batting is concerned. However, he had a good time behind the wickets. Pant took 6 catches in the first Australian innings. In the process, he became the first Indian wicketkeeper to be involved in 6 dismissals against Australia. Among other wicketkeepers with 6 dismissals against Australia are Denis Lindsay (South Africa), Jack Russell (England), Alec Stewart (England), Chris Read (England) and Matt Prior (England). The former West Indian keeper Ridley Jacobs tops the chart with 7 dismissals against Australia. He took 7 catches in 2000 at the Melbourne Cricket Ground. The young Indian keeper achieved another milestone in the ongoing Test at the Adelaide Oval. He equaled MS Dhoni’s record of 6 catches in an innings and became the second Indian keeper to achieve the landmark. Dhoni had achieved the feat in 2009 in a Test against New Zealand in Wellington. The most number of catches in an innings ever taken is 7. Pakistan’s Wasim Bari, England’s Bob Taylor, New Zealand’s Ian Smith and West Indies’ Ridley Jacobs are the joint holders of the record for the most catches in an innings. 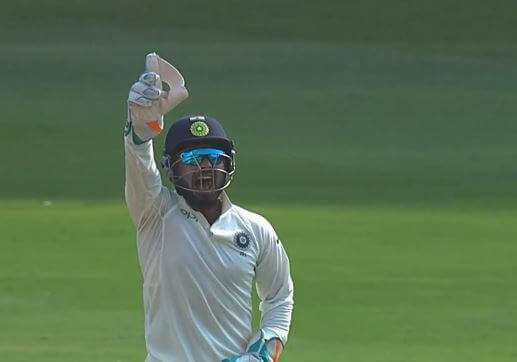 Rishabh Pant took the catches of Usman Khawaja, Peter Handscomb, Tim Paine, Mitchell Starc, Travis Head and Josh Hazlewood. So far, he has looked comfortable behind the wickets. Wicketkeepers tend to enjoy keeping the wickets in Australia as the pitches offer true bounce and the ball comes in at a good height behind the wicket. Also, the ball doesn’t swing much which makes it easy to line up.